This affordable 12.2-inch Windows tablet will launch powered by a Kaby Lake processor, offering 5G connectivity and up to 256 GB storage space (up to 128 GB internal and 128 GB via microSD). 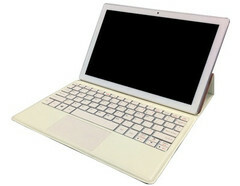 E Fun will be present at CES as usual, and one of its products is the new Nextbook Flexx convertible. Expected to retail as E Fun Nextbook Flexx 12 Flip, this Windows 10-driven 2-in-1 has a 12.2-inch screen and promises to offer support "for a variety of A/V formats makes it ideal for watching videos, reading, listening to music, and looking at photos." The Nextbook Flexx 12 Flip is driven by an unspecified Intel Kaby Lake processor, has a metal case and a detachable keyboard. The IPS touchscreen display offers 1,920X1,200 pixels, the list of features also including Bluetooth 4.0 and 5G connectivity, USB Type-C, as well as support for up to 256 GB of storage space, split evenly between the microSD slot and the internal memory chip (probably eMMC, since the main camera only offers 5 MP). E Fun Nextbook Flexx 12 Flip will retail loaded with a variety of apps, including Barnes and Noble Nook, Flixster, or Vudu movies and TV. Shipping is expected to begin in Q2 2017, but in the meantime, this convertible will be shown at CES 2017.